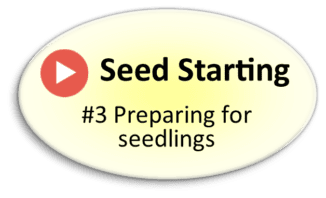 Tackle your seed starting dreams! When to start what seeds. What you need and how to do it. Walk along as Lisa starts seeds for the farm. Get a great start to your gardening season! Seed starting couldn’t be any easier! Each week I will post a short video (10 minutes or so.) You will have opportunity to leave questions and comments right below the weekly video and I will answer your questions! I look forward to meeting you here and getting the conversation going and helping you with your seed-starting dreams! Looking forward to start some seeds. Thank you so much for sharing. Wonderful information for this beginner! 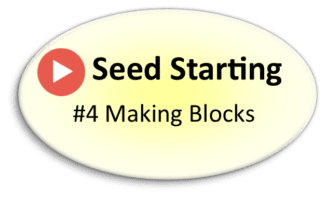 When seeds need to be covered with dirt to germinate, what is the best way to handle that and still keep the integrity of the tiny seed blocks? Push the seed deeper into the soil block with a toothpick. I heard you speak at Mother Earth News–7-Springs, PA 2016 and I have been thinking about your lecture ever since. Where did you purchase your shelving for the indoor growing you show in your videos? I am wondering if you have to use the small blocks, or can you start with the large? it seems like twice the work to plant once, then replant into a larger block. Also, can you use a regular tray? Looks like you may be using cafeteria trays, is there any danger in the heating mat with those? I am wondering why to start in a small 3/4″ block only to replant into a 2″ block. Why not just start in the large block? I have been in awe when you speak of planting out in late Feb. I am also in zone 7 but up on Cape Cod. The ground is frozen solid and will be on and off for the next 2 months. Can you provide other guidelines for when you would plant out such as a temp range night and day or anything else you would use to gauge. I can cover with remay but I haven’t even started any seeds because it is usually May before I would put things out. Thanks its a great resource! Kristie, Do you have my book Cool Flowers? It helps you to figure all this out. I also have a book study that goes along with it. Do lisianthus require light to germinate? Using soil blocking, I planted my seeds in a dark room 2 weeks ago and nothing has happened. I’ve used the heat mat and watered daily. I’m thinking they may need light. The room temp. is 59 degrees. They do need light and warmer conditions, around 70 degrees. Takes 10-20 days in those conditions to sprout. Lisa….Thank you for developing and sharing this seed starting information. I have been so hap hazard in the past with starting seeds. I’m excited about applying a method to the madness and using the soil blocking. Thanks for the clarification comment on the bulbs in this session! I hope I can make it to your open Farm Day in June. On week 2 you shared that you use the 6-8 week mark as a time to “plant out”. Then counting back even further for starting the seeds. I always thought that was the time to sow seeds. Each source seems different for calculating these dates. Can you please clarify for me? I also realized your last frost is a full month before mine! Ha! The 6-8 week date is when transplants and seeds to be direct sown are planted out. Stock is hardy so a cooler area with lightsome is fine. We plant ours at 4 weeks old. Please share some information about the organic powdered fertilizer you use when planting the beds. Where can we find it? We have found your advice to work incredibly well. This is my first year flower farming and so far so good! I’m in California, so our growing season is super long. I’ve been busy and happy using your methods. Thank you a zillion! I have been loving these videos!!! I use a big calendar too!!! Thanks for doing these video series, I love them! Can you share your hardening off process for hardy annual seedlings going into early spring gardens? Farrah, I was just looking at my stock seedlings this morning wondering I when I was going to push them out into the cold. I will cover that in week 4 coming soon. I generally don’t do a lot of hardening off in early spring–take them straight to the garden, plant, hoop, and row cover. They do the cold so much better than the heat of summer. So my answer is, I don’t. 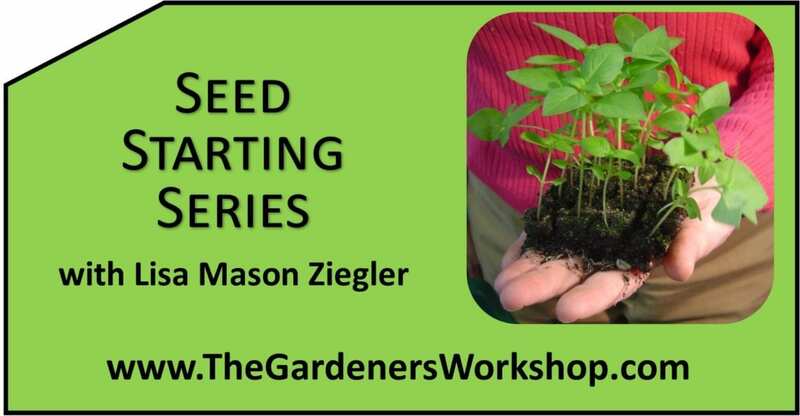 Hi Lisa, can you share your hardening off process for hardy annual seedlings going into an early spring garden? Thank you for these video series – I love them! 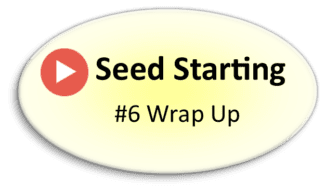 Even though I’ve done seed starting for 4 years, this series is soooo awesome! This is the second year I’ll be doing soil blocking. I’m sold on that method! You’re a wonderful teacher! Just joined after hearing you with CL Fornari on the radio. Looking forward to your information. Every year I tell myself that I will not start seeds as they never do well. Maybe this year will be different!! Jane I hope this year turns out to be a bumper crop of seedlings! Either of those would work fine. I’ve used cow manure compost several times with great success. You have given me so much priceless information. I’m a first year Flower Farmer in Northern California, I purchased “Cool Flowers” and your soil blocking grow kit and have had great success. Thank you for these posts – timelines are my greatest challenge, thus, this couldn’t be more perfect. Thank you so much! I spread the word anytime I get the chance. Cool! Great idea! Can’t wait to see them all! Thanks Dani. When you get to be an old woman you like hearing you’re cute.